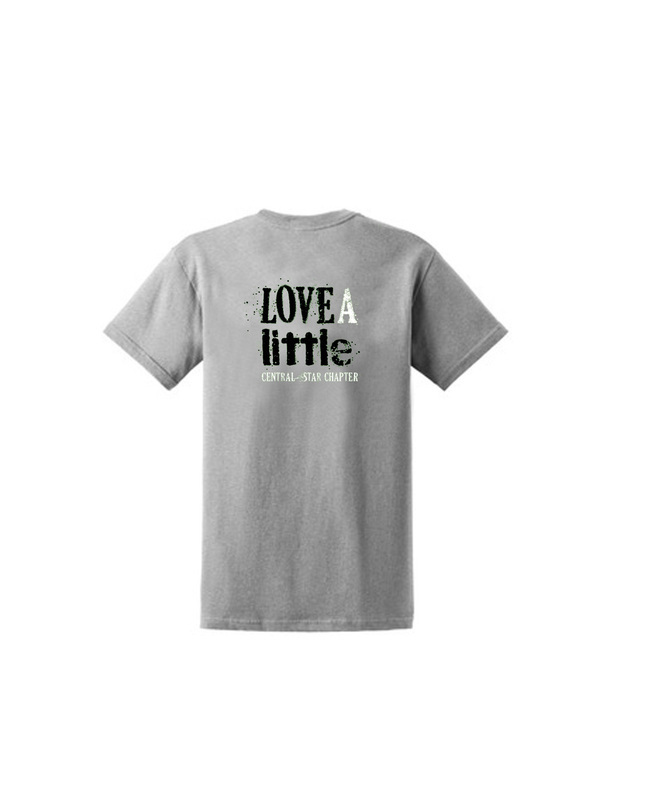 T-shirts are $12 each for any size - toddler sizes 2T to 4T, youth sizes YXS to YXL and adult sizes S to 5XL ($2 extra for XXL and larger). Colors available for youth and adults are Ash Grey, Irish Green and Lime Green. Colors available for toddlers sizes are Ash Grey and Lime Green. Hoodies are $25 each for any size - youth sizes YXS to YXL and adult sizes S to 5XL ($2 extra for XXL and larger). Colors available are Ash Grey and Irish Green. Shipping costs will be billed to the email stated on order placed. For no shipping costs, please indicate on the order form the local Kansas City Area LP family to whom the order will be delivered. PLEASE REVIEW YOUR ORDER TO VERIFY THAT YOU ARE ORDERING FROM THE CORRECT SECTION BELOW. CENTRAL STAR CHAPTER ITEMS WILL HAVE THE "CENTRAL STAR CHAPTER" NAME AT THE BOTTOM OF THE LOGO AND WILL BE NOTED IN THE DESCRIPTION. NON-CHAPTER SPECIFIC ITEMS WILL NOT HAVE "CENTRAL STAR CHAPTER" IN THE LOGO AND WILL NOT BE NOTED IN THE DESCRIPTION. Black and White logo on the front and LPA logo on the back. Red and White logo on the front and LPA logo on the back. LPA logo on the front left chest and Black and White logo on the back.